A zero day vulnerability takes down some major wikis, how Polish researchers hide secret messages in Skype’s silence. Plus quitting your job and make your successors life a little easier, a war story, and a big batch of your questions, and our answers! They have created software called SkyDe (SkypeHide), which intercepts some of the silent packets and replaces them with an encrypted message. On the other end, the software decrypts the hidden message, which can contain text, audio or video. It was the summer of 2005 and I was attending a local University of Wisconsin 2-year community college and working in IT there at the same time. The entire IT department consisted of my boss, who was the “everything admin,” myself, and one other student. That place was jinxed. Every time the boss left for any reason at all, all hell would break loose–whether it be our ISP would have an outage, power outages, fiber patches that would just die, or whatever. Needless to say, I was a bit nervous when my boss announced he was going to be gone fishing somewhere in Canada for 2 weeks with no access to a cellular signal. If anything broke that we couldn’t handle, we were to contact the higher-ups in Madison. Everything ran smoothly Monday and Tuesday. Things were looking up. I arrived at work Wednesday morning and the dean met me at the door. He informed me that there was a power outage overnight and none of the admin staff had access to voicemail. I was not pleased to hear this as I had never so much as touched the voicemail system. The other student employee had never done anything with it either, but we decided to take a peek and see if we could figure it out. To make things even better, my office phone was dead and so were all the other phones in the newer buildings on campus. The phone system at the campus was made up of two small Nortel DMS–100 switches. The first one was installed sometime in the early 1980s and was mostly full. This one serviced the older buildings on campus. The newer buildings were serviced by a newer DMS–100 that included a voicemail module on one of the line cards. I powered on the serial terminal sitting on top of the newer DMS–100 and found an error message indicating the source of the problem. One of the fans in the chassis failed and the unit would not boot until the fan had been replaced. Nortel could have used a few lessons in making parts replaceable. It took 10 minutes of tinkering to get the front panel off and find the failed fan. It was completely seized up. A few more minutes with the screwdriver and the fan was removed. It looked like a standard 120mm case fan at first but then my co-worker noticed that it was a 24v fan. So much for that idea. I called down to Madison and talked to one of the admins there. Naturally, this unit hadn’t been covered under a service contract in the past 5 years or so. He told me to see what I could come up with. I did some googling and found a few fans that might work, but none of them had a speed sensor wire and they would take a few days to arrive. That wasn’t going to work. My next thought was to get a 12v regulator or some resistors to build a regulator and run a standard 120mm fan. The physics lab didn’t have any of the parts I needed and the local Radio Shack was useless (I could do it now but back then I didn’t have the hardware skills to hack one together from the parts RS had…) Meanwhile, my co-worker was fooling around with the dead fan. He grabbed the fan blades and twisted and it came unstuck. It didn’t spin very well but we figured it might not have to. We went back downstairs and re-mounted the fan. I power-cycled the chassis while my co-worker used a can of compressed air to spin the blades of the fan. Success! The switch booted up. We quickly unhooked the fan so it wouldn’t short anything out and put the covers back on the cabinet. Luckily there were no line cards behind the fan so it’s failure wouldn’t affect the switch too much. Everything booted up and was stable. The bosses in Madison were impressed and said they would work on a replacement fan. When I left a year later there was still a can of compressed air on the top of the switch in case the power went out… Thinking back, I wonder what my tuition money got spent on. 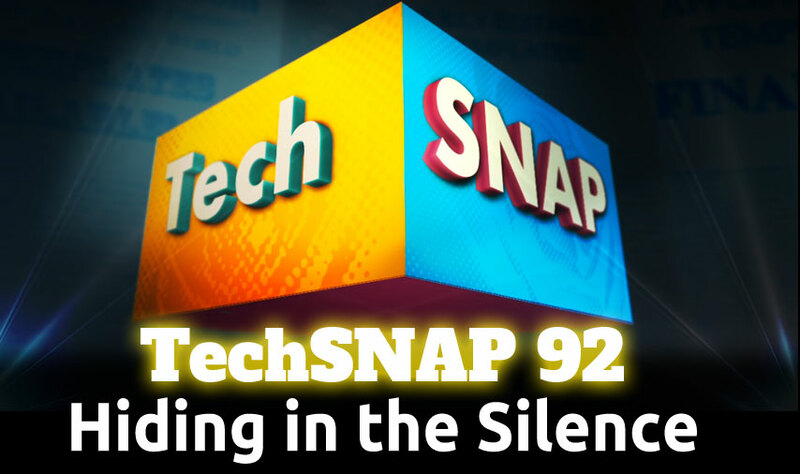 Thanks for your continued efforts on TechSnap, LAS, Unfilter, Coder Radio, Sci Byte, and the Faux Show. They keep me company when the dog is running me after work. Adobe, Apple and others didn’t test their software against future dates. What other breakages didn’t we hear about?